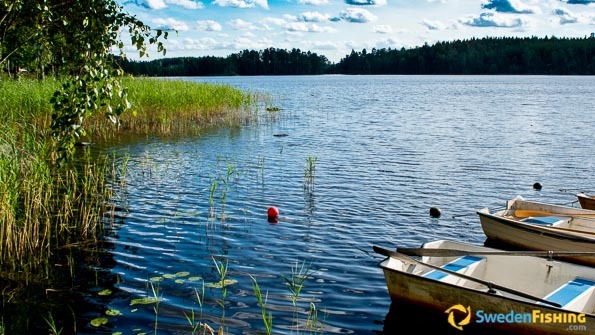 Join us on a fishing tour among the islands and the many species of Lake Örsjö. You will stay at Kalvhult Gård estate choosing one of our modern, well-equipped leisure houses near the water. The silence is total and you can focus on a completely undisturbed fishing. Our electrically powered boats will take where you wish to go without a sound. At Kalvshults Gård we speak Swedish, Danish, English and some German. We are open all year for our fishing guests. Pike is best in the spring and autumn, while perch and pikeperch like the warmer water between May and September. Wintertime ice-fishing is something special. Bicycles for hire, visiting Ikea in Älmhult, swimming in the lake, bird watching, picking mushrooms, elk (moose) park, Linnaeus Country and the Brio Lekoseum (Playoseum). There is always a boat is included in the cabin rental, and you can add an electric motor if you like. 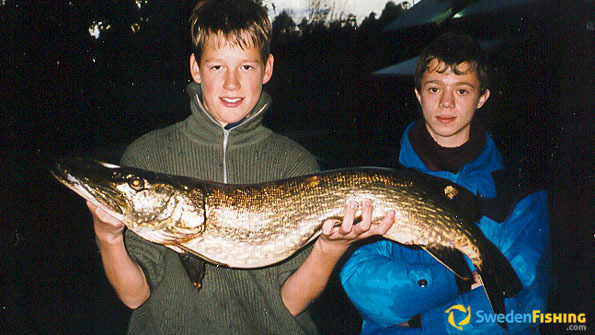 You can always catch pikeperch, pike, perch , trout, tench and eel in Lake Örsjö. A boat is included in the cabin rental at the Kalvshult Gård estate! All our boats are plastic ranging from 3.5 to 4.5 metres. You can rent both an electric motor and simpler fishing equipment. 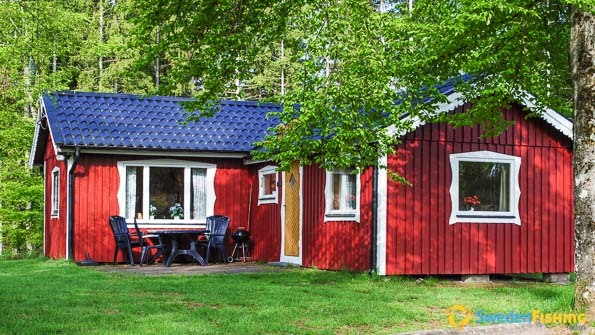 We offer different rental cabins: // Enebackan // (90 m2) has a lounge with wood-fired stove, TV, kitchen with table, range, microwave, dishwasher, refrigerator/freezer, 3 bedrooms with 6 beds, WC, shower and washing machine. There is a roofed patio with outdoor furniture and grill about 200 m from the lake. // Skogtorpet // (95 m2) has a lounge with TV, kitchen with table, range, microwave, dishwasher, refrigerator/freezer, 4 bedrooms with 8 beds, WC, shower and washing machine. There is a patio with outdoor furniture and grill about 800 m from the lake. // Sjöstugan // (70 m2) has a lounge with TV, kitchen with table, range, microwave, refrigerator/freezer, 2 bedrooms with 5 beds, WC & shower. There is a patio with outdoor furniture and grill about 500 m from the lake. // Bikupan // (75 m2) has a lounge with wood-fired stove and furnished loft, TV, kitchen with table, range, microwave, dishwasher, refrigerator/freezer, 2 bedrooms with 5 beds, WC, shower and washing machine. There is a patio with outdoor furniture and grill about 500 m from the lake. // Fridhem // (63 m2) is fully equipped and located about 1200 m from the lake.